Tri Star CNC Services is your trusted parts provider for FANUC parts & components, including servo units, spindle amplifier modules, power supplies, control boards and more. If you don’t see the replacement part you need on our website, give us a call and we’ll check our exchange stock for availability. Note: Fanuc Part will open in a new window - Close that window before another search. If your part number is not listed, please Contact Tri Star. When old, aging electronic components fail, CNC machines can’t function properly and it’s time for replacement/repairs ASAP. FANUC controls rely on repeated precision and they can’t cut it when its electronic parts are in anything less than 100% working order. You may request part repairs or replacement from our exchange stock of used refurbished units. Please contact us for availability and expected turnaround time. Field service – we work with trusted independent on-site service companies. If on-site CNC machine repairs are needed to replace motors, drives, PCB’s or other machine tool components, we’ve got access to a wide network of some of the best of the best. We’ll help you determine the best course of action and set you up with one of the finest CNC techs in America. You’re in good hands. 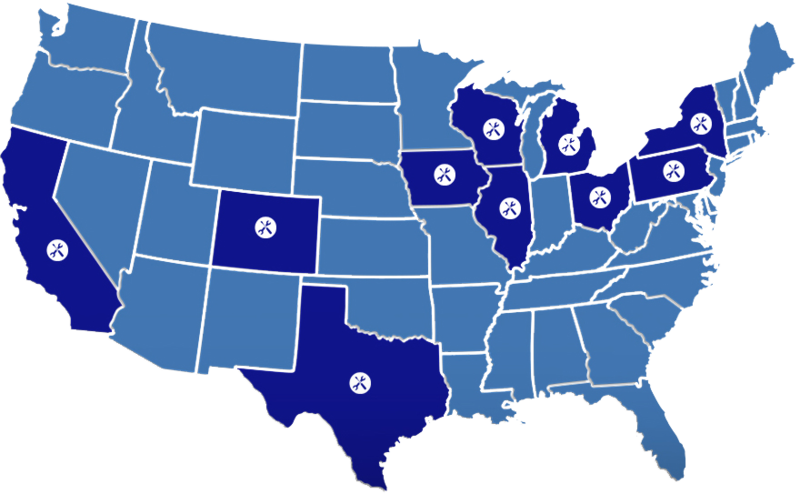 View our preferred service providers around the United States. Our 1-year warranty is the best in the business. Most FANUC repair companies will only cover parts and labor. Tri Star CNC Services covers the COMPLETE ASSEMBLY REPAIR for 1 year following initial shipment of the product(s). That’s security you won’t find anywhere except Tri Star CNC Services.